A West Country class Light Pacific in 2.5 inch gauge. Despite being brought up in GWR territory I have always had a soft spot for the Bulleid West Country Pacifics in their original form. About thirteen years ago my thoughts turned to this project and one of my original views was that I did not want to build bigger that 3½". 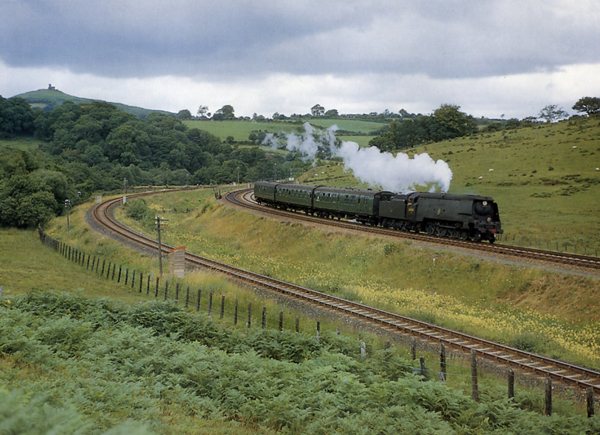 Coming across the National 2½" Gauge Society I picked up the list of designs that Chris Barron offers and there amongst them was a West Country Bulleid Pacific. However, for one reason or another I decided that instead of building to that drawing I would design from scratch. My intention is to produce a model that, when viewed from a distance of a few feet, is a fair representation of a WC with all of the most prominent features reasonably accurately represented. Discovering that WCs varied in design so much during their life (one of the factors, strangely was where they were built, Brighton or elsewhere for instance), that I am basing mine on the last few built, 34100 onwards. I have yet to decide on the number but it is to be called "Marytavy". The first picture is the clue. My Grandfather was organist for the Devon Church on the tor, Brentor St Michaels; and he lived between Brentor Southern railway station and Marytavy Great Western station. As West Country pacifics 'Lyford', 'Brentor' and 'Tavistock' existed, and because my engine is not based on one particular prototype, my engine is named after the village that has a lot of very pleasant memories for me. In the picture, a bit further on in the direction the loco is travelling the Southern track passes the back door of Marytavy station. I use several sources for information the main one being a series of articles that were published in the now defunct "Model Railways" magazine. I came across it by chance but it is "Portrait of a Locomotive - 13. OVS Bulleid's West Country Class, Southern Railway by Bernard Wright, Drawings by Russell S Carter." This series started in July 1974. The detail is superb and the line drawings with principle dimensions are as good as it gets. Also, "The Southern Pacifics. Bulleid's Radical Design" by Roger J. Mannion; "The book of the West Country and Battle of Britain Pacifics" by Richard Derry; dimensioned drawings by F J Roche, and various other printed references. As I live in Hampshire I am not too far away from various full size originals that are or were in various stages of overhaul or restoration. Additionally a large quantity of Bulleid drawings are now safely stored in the National Railway Museum from which copies can be obtained, although I use this resource as a last resort. Where would we be without the computer ? For the design and drawing work I started out using a 2D CAD programme, but as the project became more complicated 2D was becoming more than a bit tedious so I purchased and am using TurboCad 3D CAD software. One thing that perhaps I should mention is that I want to incorporate chain driven valve gear working on all three cylinders. In the other gauges builders have successfully achieved working systems, and the larger one goes the easier it is to close in on full size. At 2½" gauge I accept that it is not going to be a true representation, not even getting close; but I felt that as I am building one of the classic locomotives then I wanted at least a strong flavour of one of its major features. I am sure that when running there are going to be limitations so I am not going down this path with the expectation of having a flawless valve gear; there are going to be issues and problems. One major point of compromise is that in full size the drive for the piston valves is taken through a rocker system but in this size it just is not practicable, so I am scheming a direct drive to the slide valves. The chain that I have sourced is of 0.1475" pitch. 1. Various 2D design layouts and sketches. 2. 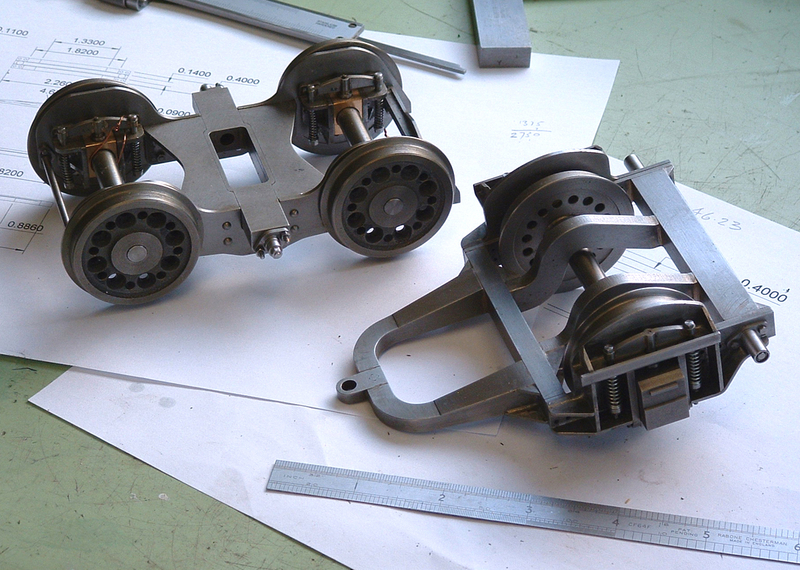 Bogie, Trailing Truck, Driving wheels, Manifold, Regulator, Slide Bars, Frames, Various individual components in 2D. In 3D. The main locomotive assembly comprising most of those just listed and motion and valve gear design. It is now easier to just create a single 3D model adding to it as the project progresses. At the moment the 3D model comprises 47 layers and the list is growing. The boiler is part of this and has been individually detailed, and then subsequently approved by my Society boiler inspector and an authority from the National 2½" gauge Association. Regarding the main frames, on this gauge running with curves of smallish radius, I am concerned that the trailing truck wheels will foul the main frame. Unless I really have to, I don't want to put cut-outs in the frames as they are not present in full size. 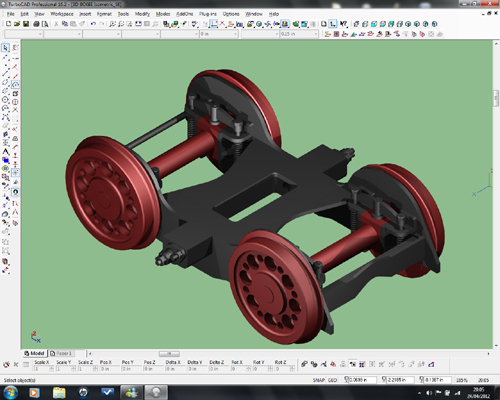 The plan is to cut the frames between the rear driving axle and the rearward periphery of the rear driving wheels, then to attach to the inside of the frames what amounts to frame extensions. I propose to make the frames from 2mm thick steel – probably Ground flat stock - this means that the frames underneath the footplate will be 0.158 narrower than further forward. From a small distance it should be difficult to tell that there is this change to the frames. Similarly, at the front the frames are visible beneath the smokebox door quite prominently, and I want to achieve roughly scale width and thickness. This can be achieved by cutting the main frames in the region of the outside cylinders, and adding 1.5mm thick frame extensions attached to the inside of the main frames. 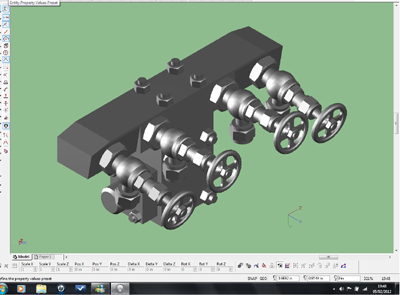 Work in progress: Motion and valve gear design. After this, the smoke box where I have already established as part of the boiler design, that I can fit in a Doug Hewson style superheater. I want to retain one of the classic features of Bulleid's Pacifics, the large diameter chimney, so will be looking at Lempor draughting to achieve this. This is a wonderfully curvaceous assembly that was very interesting to build. On full size the truck frame is a welded channel construction with not many straight lines. The components have been cut out of plate so that it will look all right, not that there is much to see anyway. The main curved frames are water jet profiled. This is one of the features that stand out – the side control spring housings and the front stretcher in particular. Using various sources I have ended up with what is really a half size version of Keith Wilson's "Ariel" that has been WC'ized. Apart from interconnection detail to the main frame this is complete. 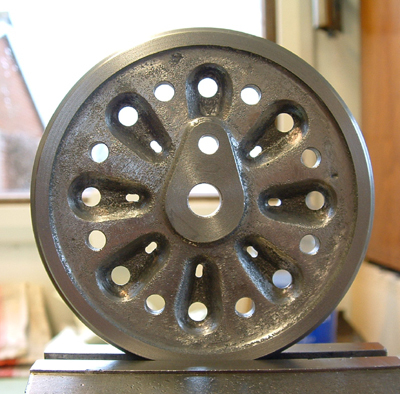 Machined from castings supplied by the National 2½" Gauge Society. 1. Manifold. 2. Regulator assembly - a half size "Sweet Pea". 3. Safety Valves - to Gordon Smith internal design. 4. Firehole doors. 5. 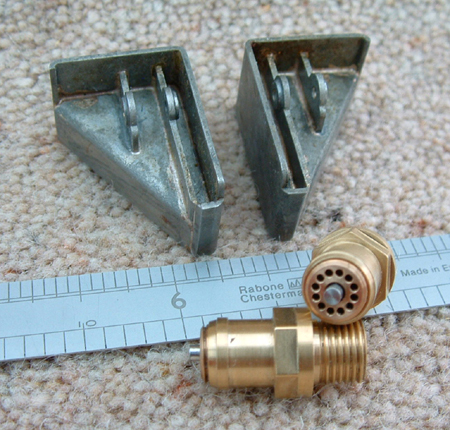 Tender water valves (needed one for another loco so decided to make a batch). 5. Various bits and pieces. 6. 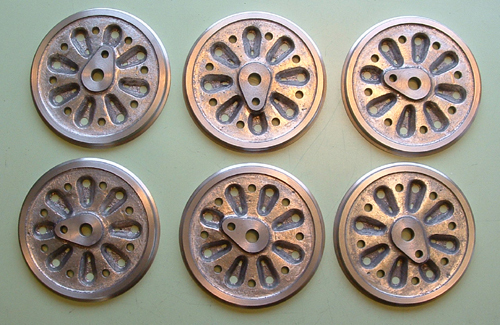 Formers for boiler flanged plates. 7. 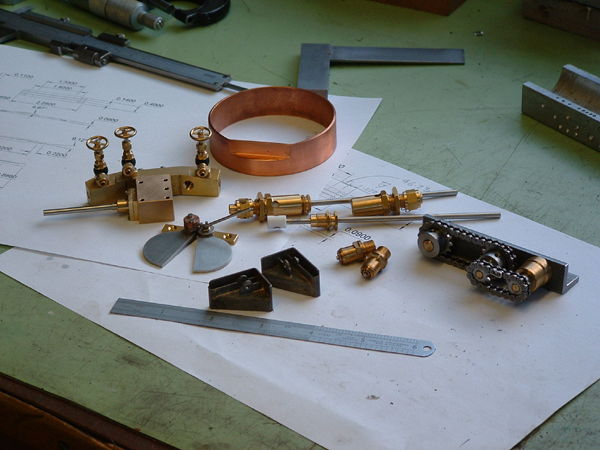 Work in progress: Boiler components and slide bars.